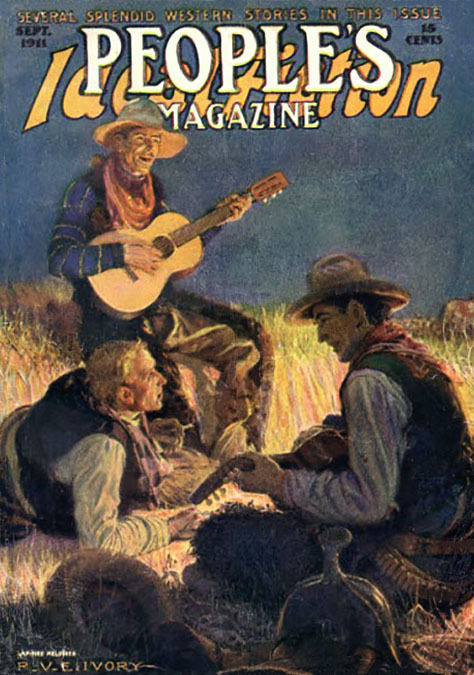 Percy Van Eman (Vanneman) Ivory was born October 11, 1883 in Sacramento, California. His father, Edgar Durke Ivory, was born in 1839 in Pennsylvania. 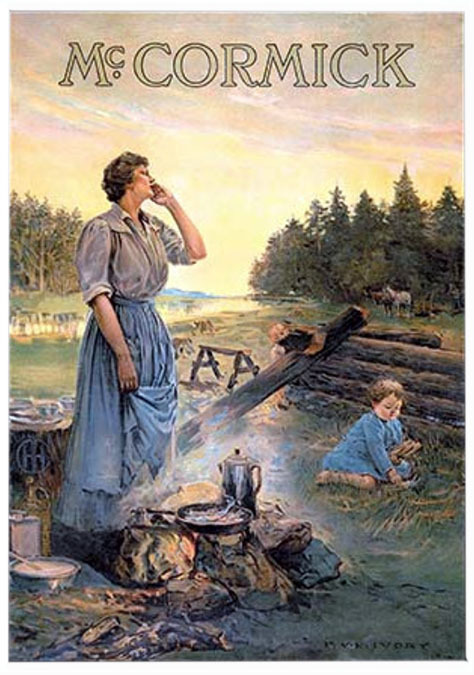 The father's family was among the first pioneer settlers in the Livermore Valley region of California. His mother, Clare Isadora Glass, was born in 1854 in CA. His parents married in 1871 and had three children, Laura Ivory (b.1874), Lloyd Ivory (b.1881), and Percy Ivory (b.1883). The father worked as a mail clerk for the overland train between San Francisco and Ashland, Oregon. In 1893 the oldest child, Laura Ivory, married Fred Wood, a lawyer, and moved to Oakland, CA, where they lived at 838 30th Street. On June 23, 1898 the father, Edgar Durke Ivory, died of a heart attack at the age of fifty-nine in San Francisco. After this tragic death the widowed mother and two young sons left home and moved to Oakland to live with her daughter and son-in-law. The boys attended school in Oakland. 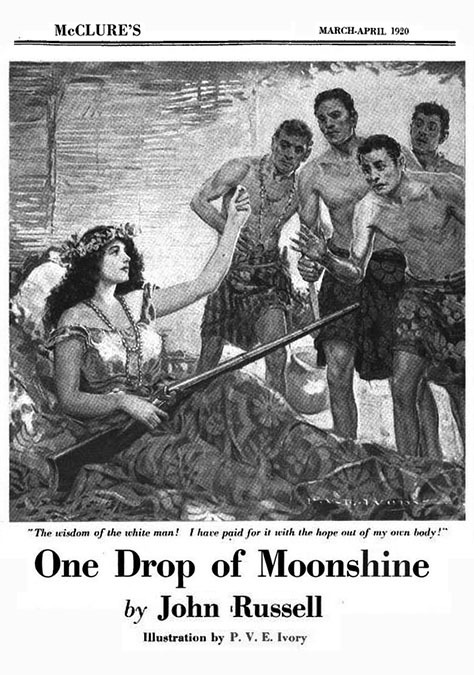 Percy V. E. Ivory became interested in a career as a commercial artist. He studied art in Oakland and became an accomplished draftsman. 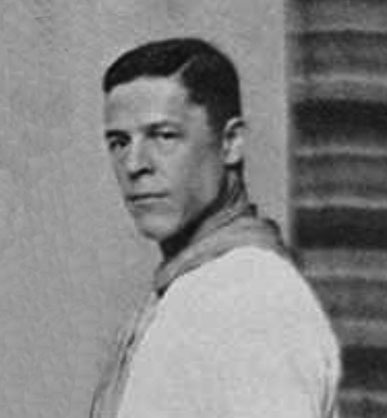 In the summer of 1904, at the age of twenty, he visited Mexico. In October of 1904 Percy V. E. Ivory left home in California and moved to Wilmington, Delaware to study with Howard Pyle (1853-1911). He lived in the student studios at 1305 Franklin Street. 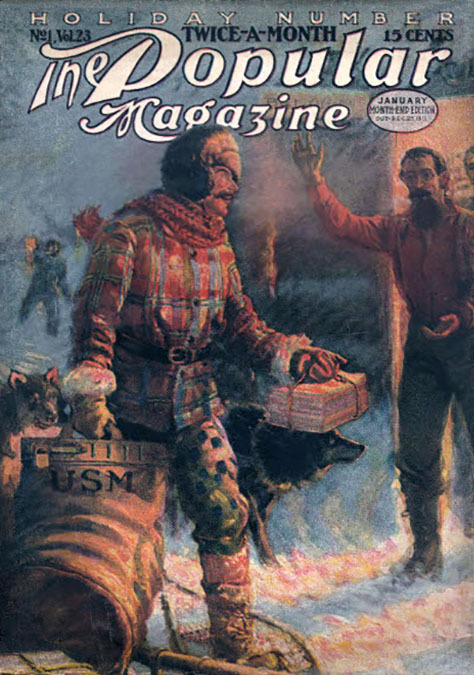 In the autumn of 1905 Howard Pyle wrote letters of introduction to recommend Percy V. E. Ivory to art editors at McClure's Magazine and Collier's Weekly. His professional career was an instant success. 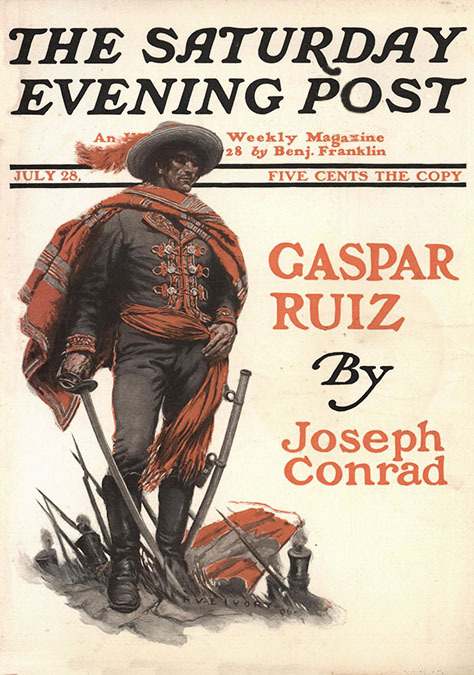 In 1906 The Saturday Evening Post hired Percy V. E. Ivory to illustrate "Gaspar Ruiz" by Joseph Conrad, which was featured on the cover. In 1909 Percy V. E. Ivory left Wilmington and moved to a nearby suburb, Claymont, Delaware, where he lived in a house on Philadelphia Pike, at the intersection with Naamans Road. 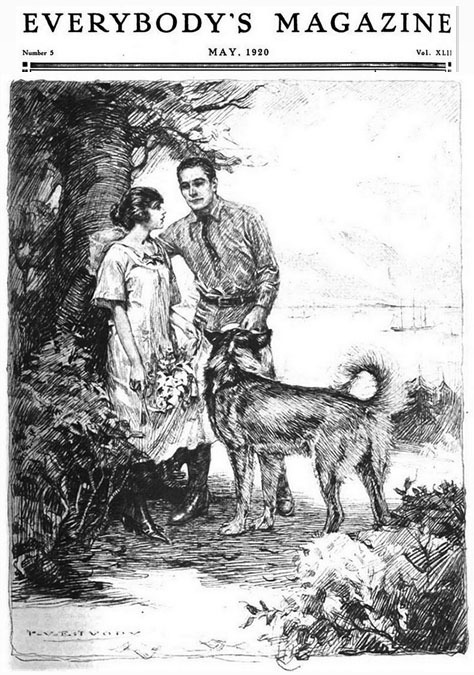 He shared the house with four other artists, who were all alumni of Howard Pyle's school, Herbert Moore (b.1870 in Indiana), and Edwin Shrader (b.1869 in Illinois), William H. D. Koerner (b.1870 in Germany), and his wife, Lillian Koerner (b.1873 in Michigan). This group of artists that lived at the house on Naamans Road were playfully referred to as "the Four Horsemen of Naamans." On October 16, 1909 Percy V. E. Ivory married Elizabeth Post Price in Tarrytown, New York. She was born July 8, 1886 in Easton, Maryland, where she came from a wealthy family. She was age twenty-three, and had attended College, where she studied English Literature. 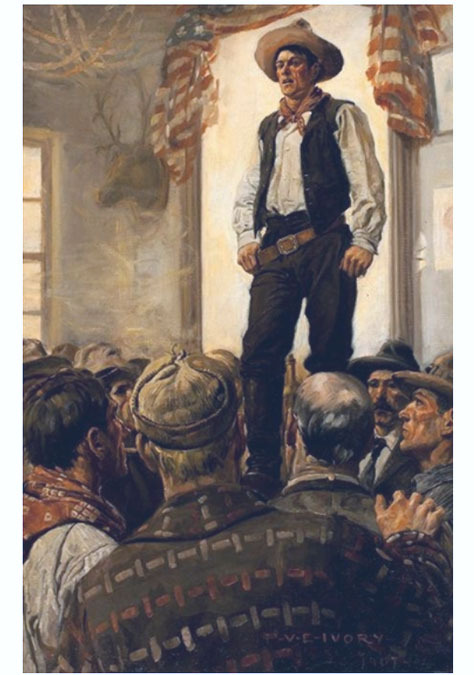 In 1910 Howard Pyle left his school in Delaware to concentrate on a major mural commission, in preparation of which he traveled to Italy, where died of an infection at the age of fifty-eight on November 9, 1911. In 1913 Percy V. E. Ivory and his wife left Delaware and moved to Philadelphia, Pennsylvania, where they lived at 518 Walnut Street. In the summer of 1915 the artist and his wife visited his family in California. They also traveled to Alaska. 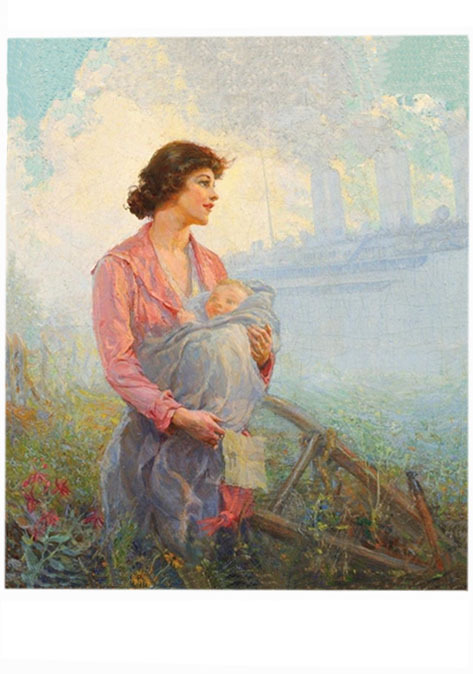 In 1916 he and his wife left Philadelphia and moved back to Wilmington, where he rejoined a thriving community of artists that included the Koerners, Gayle Porter Hoskins, Anton Otto Fischer, and Frank Schoonover. In 1918 the artist and his wife left Delaware and moved to New York City, where they lived at 145 West 12th Street. 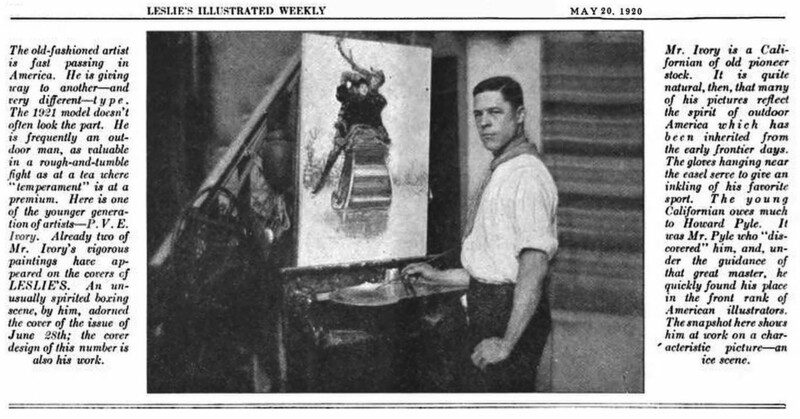 The artist worked in a studio at 51 West 10th Street. This popular studio building was an historic center of the Greenwich Village art scene. On March 28, 1918, during the Great War, Percy V. E. Ivory volunteered to serve as a private in Troop "A" of Squadron "A" Cavalry, New York State National Guard. He was age thirty-four. In April he was transferred to Troop "C."
On September 12, 1918, during the Great War, Percy V. E. Ivory registered with his local draft board. He was recorded at the time to be tall and slender, with light brown eyes and brown hair. He listed his military experience as a member of Squadron "D" of the New York State National Guard. 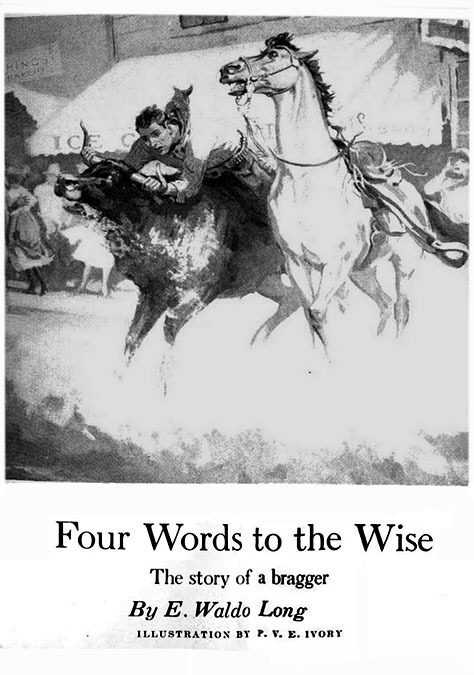 In 1920 Percy V. E. Ivory began to illustrate stories for Leslie's Weekly. 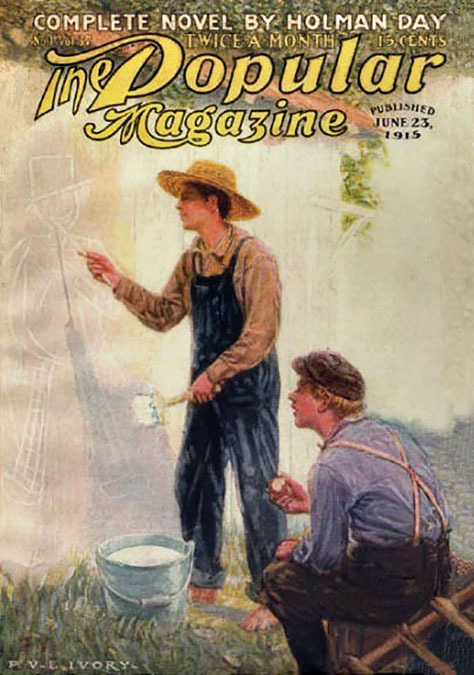 The May 20, 1920 issue featured a brief biographical profile of Percy V. E. Ivory. The 1920 U.S. Census listed Mr. & Mrs. Ivory at 51 West 10th Street. The artist was age thirty-six and his wife was age thirty-three. 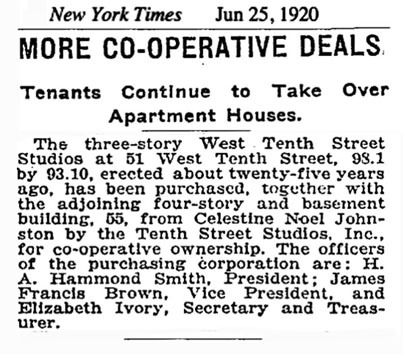 On June 25, 1920 The New York Times reported that Mrs. Elizabeth Price Ivory had joined a tenant co-operative to purchase the three-story building at 51 West 10th Street as well as the adjoining four-story building at 55 West 10th Street. 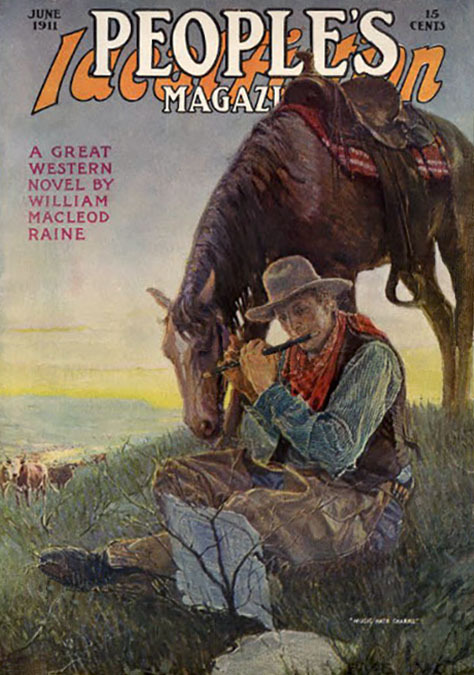 In 1922 Percy V. E. Ivory illustrated stories for McClure's Magazine, Judge, and The American Magazine, however almost no illustrations by the artist were published in magazines after this year. Two years later, the 1924 NYC Telephone Directory listed Percy V. E. Ivory as an "artist" at 55 West 10th Street, so he most likely continued to paint for his own inspiration, although he no longer worked as a commercial artist. His wife, Elizabeth Price Ivory, was also listed in the same directory, while her own career in real estate was growing more significant. In 1928 The New York Times reported that Mrs. Elizabeth Price Ivory bought a three-story building for $15,900 at 325 West 12th Street. On January 17, 1929 Mr. & Mrs. Ivory had a daughter, Elizabeth Anne Ivory (1929-2006). The mother was age forty-three and the father was age forty-six. The 1930 U.S. Census listed the family of three at 325 West 12th Street. 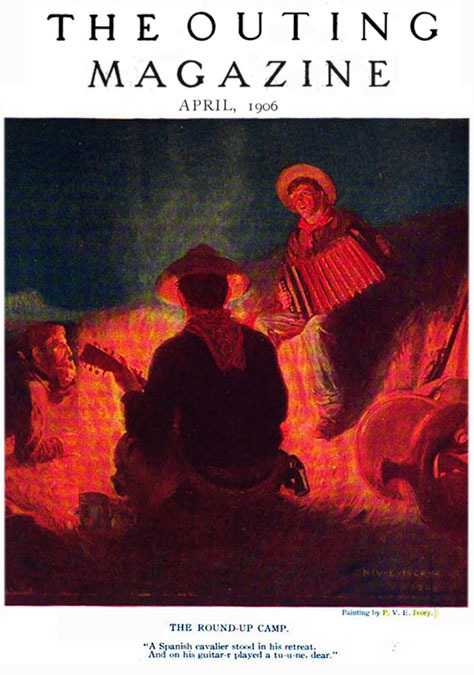 Om November 19, 1931 Percy V. E. Ivory submitted a painting to the 18th Annual Exhibition at the Wilmington Society of the Fine Arts. 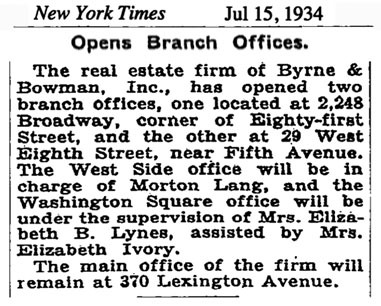 In 1934 The New York Times reported Mrs. Elizabeth Price Ivory joined the real estate firm Byrne & Bowman, which had a branch office in the store-front space of her building at 29 West 8th Street. In 1939 Mr. & Mrs. Ivory also owned a country home in Harriman, NY. The 1940 U.S. Census listed four other renters in all apartments of the building at 325 West 12th Street, so the Ivory family was living elsewhere, while they earned a steady income from rentals of their NYC properties. The 1940 NYC Telephone Directory listed Elizabeth Price Ivory at 29 West 8th Street, however there was no listing for her husband. In 1942 during WWII, Percy V. E. Ivory again registered with the selective service and was recorded to be age fifty-nine. He listed his occupation as "self-employed." 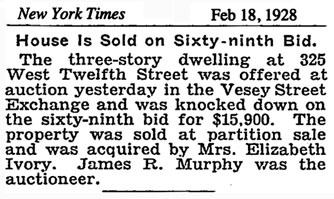 On August 8, 1945 The New York Times reported the legal transferal of 29 West 8th Street from Percy V. E. Ivory to Elizabeth Price Ivory. The 1946 NYC Telephone Directory listed Elizabeth Price Ivory at 325 West 12th Street, and Elizabeth Anne Ivory at 51 West 10th Street, however there was no listing for Percy V. E. Ivory. The 1949 NYC Telephone Directory listed Elizabeth Price Ivory at 55 West 10th Street. There was again no listing for her husband. On September 12, 1950 The New York Times reported that Miss Elizabeth Anne Ivory had acted as bridesmaid for her childhood friend, Joanne Greene, of 107 Waverly Place in Greenwich Village. In 1952 Miss Elizabeth Anne Ivory graduated from Bennington College in Vermont. After graduation she briefly worked as a commercial artist, but soon developed an active career in real estate. On June 19, 1954, Miss Elizabeth Anne Ivory married her childhood friend's older brother, James Greene II. He was born in 1928 in NYC and had graduated from Harvard in 1951. He worked as an Executive Vice President of Chase Manhattan Bank. They eventually had three children, James Greene III, Edgar Greene, and Elizabeth Greene. Percy V. E. Ivory died of a heart attack at the age of seventy-six in his Greenwich Village apartment on June 25, 1960. He was buried at the Wilmington-Brandywine Cemetery in Delaware. When his wife died eight years later, she was buried beside him. 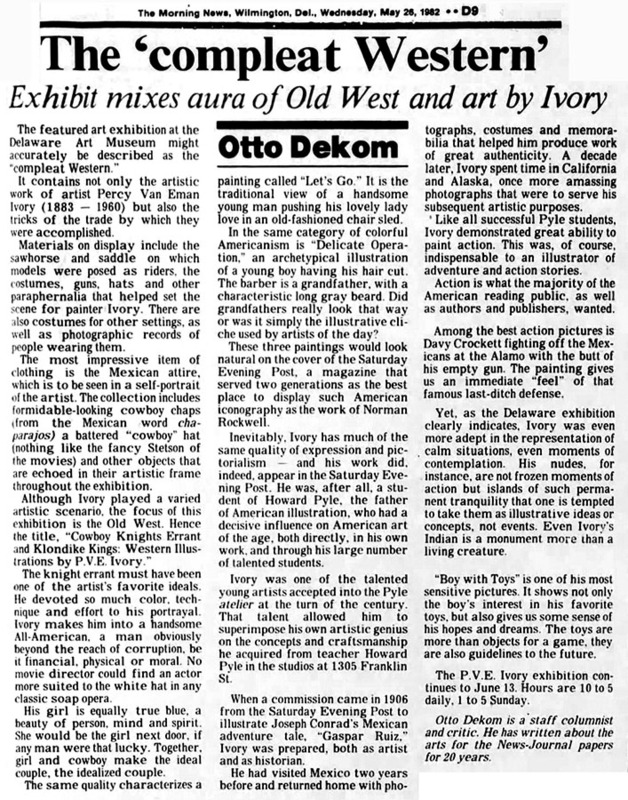 An exhibition of paintings by Percy V. E. Ivory was organized by the Delaware Art Museum in 1982.